Our Course Matching Tool is a brand new feature which helps you find the ideal course and university for you. Featuring more than 60,000 programs in the UK, US and Australia, the tool is completely free to use, and can help you narrow down your options and decide where to apply. 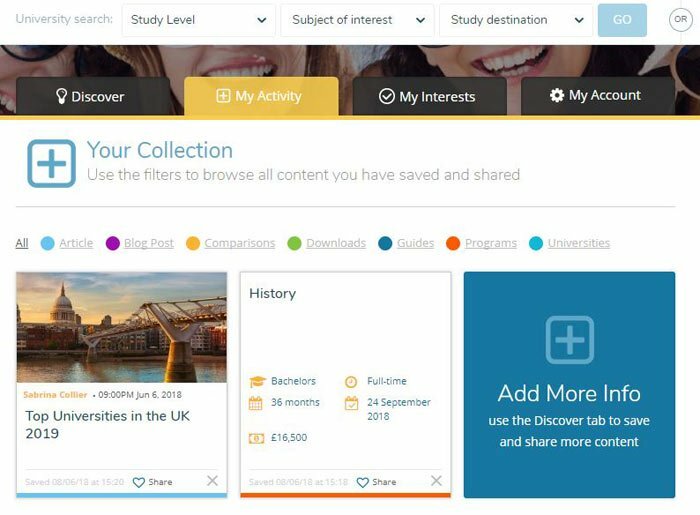 Signed-in users can also save favorite courses to their personal profile along with university comparisons, articles, guides and more (you can register for free here). To access the matching tool, simply head to Discover > Course Matching Tool in the main navigation at the top of the site. To get started, you’ll need to put in your course level, ideal study destination and preferred subject. If you’re not sure about any of these yet, you can skip these, but bear in mind that the results will be more accurate if you provide as much information as possible. 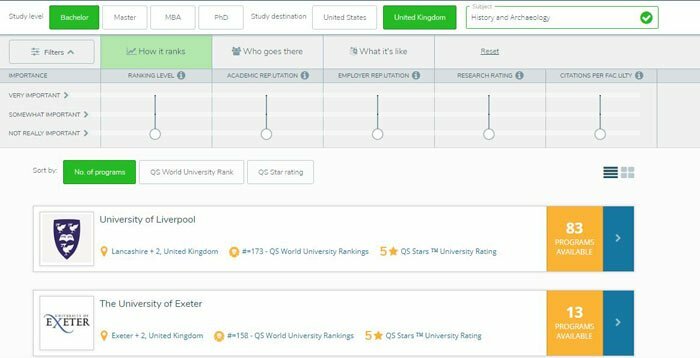 As you can see, the first suggestion currently is the University of Liverpool, but you can now provide the matching tool with further information to narrow your options down. Use the filters above the results section to say how important you perceive particular factors to be. For instance, if the university’s performance in the QS World University Rankings and its rating with employers (based on a survey of over 30,000 employers) are important factors to you, you can use the slide tool to indicate this, and universities with higher scores in these areas will show up first (you can also use the sliders to indicate any less important factors to you). You can also use the filters to indicate any preferences you have about who goes to your university – do you prefer a university with a high number of faculty members per student, or a university which has a higher percentage of international students? The final section of filters allow you to select whether you’d prefer your university to be public or private, large or small, young or old – as well as the level of English language skills you’ll require, and what your budget is in terms of tuition fees. As you can see, following the various selections, our top choice is now no longer Liverpool but Birkbeck, University of London. The results of the matching tool can be sorted in three different ways. The default view, as seen above, has the universities with the highest number of matching programs listed first, but it’s also possible to sort universities by their position in the most recent QS World University Rankings and their QS Star rating (note that as QS Stars is an opt-in rating system, not every university will have a rating to compare courses with). And voilà, comparing courses and universities is as easy as that! 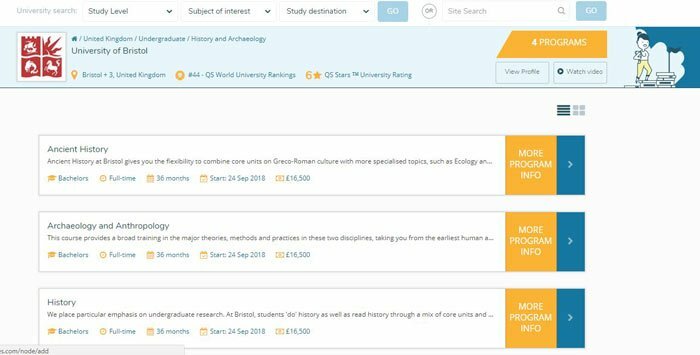 More study destinations and courses will be added to the matching tool at a later date, making it even easier to find your ideal course.